The Kagyu, like the other denominations, transmits its teachings from master to student. However, the Karma Kagyu as a practice lineage with a strong, well-defined set of transmissions -- it is known as the "ear-whispered" school -- demonstrates a clear, well-defined pattern in its history called "The Golden Garland." It is especially evident in the way the Karmapa and the Situpa maintain a special connection, as can be seen below. They have been alternately teacher and student for generations. Tilopa (988-1069) one of 84 Mahasiddhas, is venerated not only by Buddhists. His attainment was as a result of direct transmission from Buddha Vajradhara. Naropa (1016-1100) His companion, Niguma, established important lineages. Marpa Lotsawa (1012-1097) The Translator. His wife also played an important role. Gampopa (1079-1153) Dagpo Lharje or the Doctor from Kham. The First Karmapa, Dusum Khyenpa (1110-1193) Knower of the Three Times, visionary founder of the Karma Kagyu, or Kamtsang, lineage. In the Bhadrakalpa Sutra, Buddha Shakyamuni prophesied that birth of a special bodhisattva -- the sixth of a thousand buddhas to help spread the teachings and free sentient beings from suffering. He would be known as the Drukpa Senge. 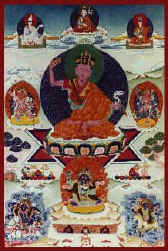 Dusum Khyenpa was acknowledged as that person. under many great masters, receiving the Kalachakra among other profound transmissions. The essential transmissions of the Kagyu lineage including the Six Yogas of Naropa were taught him by Gompopa. Dusum Khyenpa practiced fearlessly in wild and desolate places, and gradually attained complete liberation -- as Gampopa told him, he had completely severed the bonds of existence. Legend says that at the moment of his enlightenment an assembly of dakinis perceived he was a manifestation of Chenresi, so from their own dark hair they wove a fabric and created an ethereal black crown that could occasionally be seen by his followers. He devoted all his activity to the benefit of sentient beings. He taught thousands of disciples, cared for the needy, cured illness including blindness, and ended wars. At the age of 38, he built Karma Densal Temple (a.k.a. Karma Lating) near Shikang Rawoche, and built many other monasteries including, in his old age, Tsurphu, principal seat of the Karmapas for over 800 years. When he was 84, he wrote a letter of prophesy that he entrusted to his foremost disciple, Drogon Rechen, describing the conditions of his next incarnation. Completely confident, before dying he told his translator, Kang, to stay and protect the Three Jewels for his successor. Thus he firmly instituted the tulku or reincarnation system that has become a characteristic of the Tibetan tradition. In other words, he was the first person known to have intentionally taken human rebirth for the benefit of sentient beings. Karma Pakshi the 2nd Karmapa (1203-1283,) the first of acknowledged tulku. Karma Pakshi was born in Drilung to a family descended from King Trisong Deutsen. A famous child prodigy, he was ordained at 11 years of age. His teacher, Pomdrakpa, who had received the full Kagyu transmission from Drogon Rechen, heir to the first Karmapa, realized through very clear visions that his charge was the actual reincarnation of Dusum Khyenpa as indicated in a letter given to Drogon Rechen. Pomdrakpa then passed on the teachings of the Kagyu lineage to him, saying, "More wonderful than the offering of wealth filling the entire country is a great meditator who recognizes the nature of his own mind." Accordingly, until he was 21 Karma Pakshi devoted himself to uninterrupted practice. He was invited by Mongol leader, Kublai Khan, to visit China where he where taught Buddha-dharma at court. There he was accorded the title, Pakshi (Master of Discipline,) and became the personal guru of Emperor Mongka Khan. With him he traveled extensively, teaching and performing empowerments. When Kublai Khan succeeded to the throne, he conceived a grudge against the Pakshi and sent soldiers to intercept him on his way back to Tibet. His captors were unable to harm him in any way. Their ropes passed through his body as if it were a rainbow, and when he was thrown from a cliff, he floated to the ground; when cast into a lake, he was observed to glide across the water; when left to perish by the ocean, he also survived. Karma Pakshi felt only sympathy for his persecutors, and finally Kublai Khan requested Karmapa's forgiveness, becoming his disciple. He was renowned for his display of many different kinds of miraculous activity demonstrating in this way the complete freedom of enlightenment. The nature of such displays is explained as a natural consequence of an absolutely spontaneous response to the needs of sentient beings by one who is not limited by dualistic perception. Renowned for these powers, he is known in Tibetan as Drubchen or "great achiever." Mongolian king, Shen-Tsung, presented Karmapa with a gold seal of office and the Black Hat, a replica of the visionary headdress seen by those who attended his teachings. He installed at Tsurphu, the Lhachen, a precious statue of Buddha. Karma Pakshi passed away at the age of eighty. The Third Karmapa, Rangjung Dorje (1284-1339) whose image was seen on the moon. His name means "Spontaneously-manifesting Vajra." teacher." Orgyenpa bestowed the lineage transmissions and at age seven, Rangjung Dorje was ordained and enthroned at Tsurphu Monastery. His knowledge was observed to be complete without any teaching, nevertheless he eventually received instruction and transmissions from 113 teachers. He taught great masters such as the Nyingmapa, Longchenpa, and the Sakyapa, Yagde Panchen. Composer of Aspiration Prayer for Attainment of Mahamudra (Tibetan: Phyag Chen sMon Lam) the special prayer of Kagyu practitioners, and Zabmo Nangdan, the fundamental tantric text, he united Mahamudra, the highest Kagyu teaching, with the Nyingma's Dzogchen. He traveled throughout Tibet, writing and teaching, and building retreat centres and hermitages. He was a visionary who received transmissions from numerous deities and also past masters, and composed treatises on tantra and astrology, which are still fundamental to the Kagyu lineage. In 1332, he was invited to China to presided over the coronation and to teach Buddha-dharma to the Mongol rulers of the Yuan Dynasty, King NingDi and his queen. On a second trip, he conferred a longevity blessing with water consecrated by Lord Padmasambhava. Consequently, Toghon Temur was the longest lived of any of the Mongol emperors. gazing at them from the disc of the moon. This event is memorialized in carvings at the Imperial Court, and in the name Rangjung, an epithet meaning self-manifest. The Fourth Karmapa, Rolpei Dorje (1340-1383) whose name means "Vajra Play" was also lama to the Emperor. 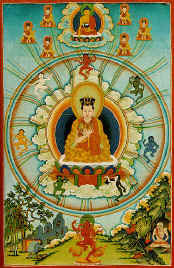 Tsongkhapa, the Kadampa reformer, was his student. Rolpe Dorje was born in the Kongpo region of Tibet. In accordance with the sacred prediction letter he sat up immediately, reciting the mantra of Chenrezig, Om Mani Peme Hung. At age 3, he told his mother that he was Karma Pakshi, who had taken rebirth for the sake of his many disciples in this world. When they took him to Lhasa, he greeted by name many of the people who had come to meet him along the way. Rolpe Dorje became a novice at age 6 and a fully ordained monk at 18, scrupulously observing every detail of the rules of conduct. Although he retained profound wisdom from his previous lifetimes, he accepted transmissions from each denomination to demonstrate the master-disciple relationship. He is said to have been able to perceive directly the presence of the deity during tantric transmission. This Karmapa was also invited to the Chinese Imperial Court, but this was a time of famine, epidemic and rebellion. By pacifying the local deities (like Padmasambhava,) and through the blessings of Medicine Buddha and the Wealth Deity, Rolpe Dorje restored harmony to the Middle Kingdom. In 1360, under his guidance, King ShunDi and the princes of the Yuan Dynasty as well as many officials including representatives from Mongolia, Korea, and other regions, aspired to attain enlightenment for the benefit of all beings ( the bodhisattva vow.) Later, when Chenzu the first in the Ming dynasty of rulers requested teachings, he sent some disciples to China on his behalf. On his way home, he visited many regions teaching along the way. He was the preceptor who bestowed the preliminary vows of renunciation upon Tsongkhapa, the reformer who founded the Gelugpa school. When he was only 43, Rolpe Dorje traveled to a high mountain peak in the northern part of Tibet where his health suddenly declined and he died. At his cremation, there was a mysterious rain of flowers and the earth trembled six times. Many people reported seeing a rainbow-bordered image of him in the sky. The Fifth Karmapa, Dezhin Shegpa (1384-1415) the first to actually wear the ceremonial black hat, the gift of Ming emperor, Yung Lo. His name meaning "Past Buddha" is also transcribed, "Teshin Shekpa." In accordance with the prediction letter of Rolpei Dorje, Deshin Shekpa was born in Nyangdam in southern Tibet. His parents were advanced tantric practitioners. Since many auspicious omens arose during his mother's pregnancy, at his birth many people gathered in order to make offerings to him. By the age of two months, he had already demonstrated beyond a doubt that he was Karmapa. Like his predecessors, he could transcend the limits of the phenomenal world having mastered his own mind, and he had the capacity of benefiting beings, maturing their mind stream. In 1407, he was received by Ming Dynasty emperor, ChenZu, who later deemed him "Great Precious Dharma King," or rather, "Reams of Virtue, Most Precious in all Ten Directions, Enlightened Gem of Wisdom, Accomplished Intellectual, Universal Protector, Guardian of the Country, Disseminator of the Dharma, Former Buddha, Great Precious Dharma King, Western Pure Land Great Liberator-Buddha [ie. Amitabha]." At the invitation of Ming emperor, Yung Lo, the ruler who established Beijing as the capital of China, he also visited the Imperial court, where he was received by ten thousand monks. The emperor was one of those who could perceive the black crown that is present above the heads of all the Karmapa incarnations, and he had made for Karmapa, a replica ornamented with jewels and gold. Dusum Khyenpa consecrated it with the divine original, thus developing the ceremony that is conducted by all succeeding Karmapas in which the vajra crown is displayed in a ritual demonstrative of the compassion of Avalokitesvara as manifest in the activity of the Karmapa denomination. When Deshin Shekpa returned to Tsurphu, he told his students that he had already arranged the conditions for his rebirth -- in eastern Tibet near Karma Monastery He died soon after and in the ashes of his remains were found images of deities and rainbow-coloured relics. The Sixth Karmapa, Thongwa Donden (1416-1453) A Khampa visionary who was a Shangpa, Shije and also Nyingma practitioner who taught the Situ and Gyaltsab Rinpoches [source: Jeff Watts' notes] His name means "Understanding Certainty" He was a great tantric practitioner and wrote detailed commentaries and texts for prayer, ritual worship or sadhana, and for the Mahakala Dance. Bengar Jampal Zangpo Paljor Döndrup (1427-1489) wrote Dorje Chang invocation. "Renowned Dharma Ocean" wrote on the 3 aspects: discipline, philosophy and tantric practice. He emphasized the importance of academic training and built the monastic college at Tsurphu, and also restored the giant Buddha installed 200 years earlier by the second Karmapa. He was especially renowned as a peacemaker who was skilled in conflict resolution. speak and understand the mantras he heard his parents reciting. At 3 months, he announced, "I possess the name Karma. One born like me is rare. My firm aspiration is to benefit all who have a connection with me." Chodrak Gyatso confirmed people's faith in the power of the Three Jewels by displaying many miracles throughout his life. He was also renowned as an exponent of tsema, the Tibetan system of logic. He composed many texts and commentaries, established important monastic colleges, and attracted disciples from all over the region. While traveling through east Tibet, he had visions of Guru Rinpoche and Buddha Shakyamuni, who showed him the locations of secret valleys (Tib. beyul) where friends and Kagyu practitioners could take shelter from the sectarian conflicts that were prevalent at that time. Karmapa passed away at 52. On the ribs and spine recovered from the remains after cremation there clearly was displayed the eleven-faced, thousand-armed form of Chenrezig. Sangye Nyenpa, mahasiddha emanation of Maitreya, subsisted on bar lung. "Immoveable Vajra" was the author of Commentary on [Chandrakirti's] Madhyamak'avatara and also the commentary on Maitreya called Rje-Btsun Ngal-So in Tibetan. His work also includes topics such as linguistics, monastic discipline, the sutras, as well as poetry and art, and texts for tantric practice and Mahamudra. Mikyo Dorje was born in Damchu, east Tibet, in circumstances matching details in the prediction letter that had been left in the Third Tai Situ's possession. When his parents presented him with gifts from that Rinpcoche, Mikyo Dorje exclaimed, "Emaho! Do not doubt me, I am Karmapa!" He eventually went with Situ Rinpoche to Karma Monastery, where he concentrated on study and meditation. He became a great artist, whose style of painting deities had a wide influence throughout Tibet. He was known to have performed many miracles, such as leaving impressions of his feet and hands in stone, and squeezing stone as if it were dough. He was also the one to introduce the use of the Karmapa khyenno mantra. The 8th Karmapa was also a brilliant scholar and prolific author. Like Shakyamuni, he taught that all appearance is no more than interdependent manifestation that is relative to subjective experience. He emphasized the view that the essence of all things is beyond mere nothingness, and can only be recognized through direct realization devoid of any concept or dualistic view. This is the Shentong (Empty of Other) view and the approach that continues to be characteristic of the Kagyu lineage. Mikyo Dorje traveled the various regions of Tibet, propagating the Dharma and benefiting thousands of people there as well as in neighbouring lands, using a caravan or traveling camp known as the Karmay Garchen. He composed over 30 works that include the subjects of psychology, philosophy, logic and vinaya, as well as Mahamudra tantras, and treatises on Sanskrit grammar, art, and poetry. Known as "Freedom Vajra," he compiled the Chikshe Kundrol: 100-plus sadhanas of deities in general use by Kagyupas. Also The Ocean of Certainty and Eliminating the Darkness of Ignorance. "Pointing Out the Dharmakaya" is his instruction on the Kagyu supreme teaching, Mahamudra. An intrepid traveler -- he visited Mongolia and Bhutan, and was responsible for the building of three monasteries in Sikkim -- he was also a famous teacher. Jonang Taranatha, the Kadampa authority on Tara tantra, was his student. tangka of him in later years. "Dharmadatu Vajra" held office at a time of waning Kagyu influence. "Knowledge Vajra" lived the shortest of all Karmapas, but displaying many miraculous abilities he is believed to have attained a high level of accomplishment. He combined some Nyingmapa teachings with Kagyu, and rebuilt many of the monasteries that the Mongols had destroyed. "Bodhicitta Vajra" once performed a puja in Kathmandu that is credited with halting the spread of an epidemic. The Rajah held a banquet in his honour, and later he was invited by Yuong Chang, emperor of the Ching dynasty but he died upon arrival in Lanchow. The Thirteenth Karmapa, Dudul Dorje (1733-1797) was reputed to have the ability to communicate with animals, among other accomplishments. For example, "Demon-subduing Vajra" is renowned as a terton or discoverer of hidden dharma treasures (gTerma.) He rescued Lhasa from flooding as was prophesied by Guru Rinpoche. Also while residing at Tsurphu, he consecrated a distant monastery causing a rain of blessed barley grains which many experienced and collected. The Tenth Shamarpa, Chödrub Gyamtso (1742-1792,) last to be recognized in Tibet. The Fourteenth Karmapa, Thegchog Dorje (1798-1868) or "Jewel Vehicle Vajra" was an accomplished linguist and scholar. Familiar with both old (Nyingma) and newer teachings, as well as a master of many aspects of Dharma, he promoted the eclectic approach, a movement known as rimeh that began in his home region, Kham. Jamgön Kongtrül, Yönten Gyatso Lodrö Thaye (1813-1899) "the Great," who wrote the moving " Calling the Lama From Afar," and Jamyang Khyentse Wangpo (1820-1892) as well as terton Chogyur Lingpa (1829-1870) who was a master of Vajrakilaya (Tib: Dorje P'hurba) practice, were all students of the XIVth Karmapa. "Omnipresent Vajra" was a prodigy who could write poetry when he was only six years old. Besides his accomplishments in medicine, art, and astrology, he received the complete teachings of Jamgon Kongtul and also of the Shangpa Kagyu lineage. He was a "patron of publications" and an "exemplary practitioner" [Jeff Watts] who studied the termas of Pawo Rinpoche, and the highest Triyana teachings from Khenchen Tashi Oser, abbot of Palpung Monastery. The father of the Second Jamgön Kongtrül, Palden Khyentse Öser (1904-1953) and not a celibate monk for much of his life, in his old age he went into retreat for ten years. The Sixteenth Karmapa, Rangjung Rigpe Dorje (1924-1981) "Spontaneously-manifest Omniscient Vajra." He Studied Dharma from many great masters such as Gongkar Rinpoche, the 2nd Jamgon Kongtrul, the 11th Tai Situpa, and Ugyen Rinpoche. There is a footprint on the surface of a lake in the Drotu area that is attributed to his activity, and witnesses attest to his having put his footprint in rock at Tsurphu, and at Samye Ling in Scotland, which marks are still there. He recognized many tulkus or incarnate lamas, and ordained more than 3000 monks. He sponsored and arranged for the reprinting of the Tsurphu Kangyur (the Tripitaka sutras in Tibetan) sending hundreds of these esteemed sets out to all the major Tibetan Buddhist lineages. He passed away in the USA, was cremated at Rumtek, Sikkim, and his anniversary which is in autumn is observed according to the traditional calendar. This web site is a result of his activity. April 14, 2001 issue of Border Affairs: " . . . following the production of the prediction letter by Tai Situ-pa the council of regents decided to send Kongtrul Rimpoche to Tibet to probe the possibilities of conducting [a] proper search for the new incarnate. But fate had something else in stock for them. Kongtrul Rimpoche died in a freak road accident before reaching the Bagdogra airport. His speeding brand new BMW car suddenly lost control and crashed into a roadside tree near Jalpaiguri. The Ri[n]poche died on the spot. Strangely enough the engine got detached from the car body either before or after the crash. The mystery behind this accident is yet to be solved." Tai Situ's seat is Sherab Ling. Teachings by Situ Rinpoche, India, 2003.